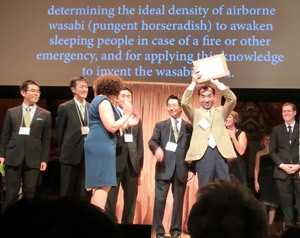 Imai Makoto from Shiga University of Medical Science won the Ig Nobel Prize in 2011 for the development of a wasabi fire alarm and is seen here joyfully displaying the award plaque above his head. Using Odor to Detect FireIn 2011, a team of researchers led by Imai Makoto, lecturer in the Department of Psychiatry at Shiga University of Medical Science won the Ig Nobel prize in chemistry for their development of a wasabi fire alarm. From its beginnings in 1991, the Ig Nobel prize has been awarded as an international prize "for achievements that first make people laugh, and then make them think." It has drawn attention as an award that helps people realize how interesting science can be, and one researcher won both the Nobel Prize and the Ig Nobel Prize for the same discovery. The researchers won the chemistry prize for their research and development of a fire alarm that utilizes the smell of wasabi, a type of strong horseradish native to Japan. The rootstalk of the plant is grated into a paste and used to season sushi and sashimi (raw fish). Wasabi has a pungent odor that irritates the nose, and it was this property of the plant that was used for the fire alarm. The researchers explored whether strong odors could be used instead of sound to make a fire alarm for people who are hearing impaired. They tried an array of odors in the developmental process, including the smell of lemons, mint and other kinds of herbs, burnt smells of sulfur and wood, and even the stench of garbage. What proved to be the most effective, however, was a component of wasabi known as allyl isothiocyanate. When wasabi has been grated, the allyl isothiocyanate contained in it is broken down by an enzyme and becomes a bitter gas that stimulates the nervous system. Surprisingly, it can wake people up, both hearing-impaired and non-hearing-impaired alike, within a period of 10 seconds to two minutes, according to the experiments. In other words, the results demonstrated that the alarm is effective not only for people with hearing disabilities, but also for people in general. Data shows that about 60% of people die in residential fires mainly because they were too slow to escape. So the wasabi fire alarm may be a useful means of saving lives by helping people escape more quickly. 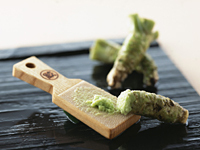 The wasabi fire alarm has already been commercialized, and facilities for the hearing impaired, some hotels, and other establishments are already using it. Can Cancer Be Detected from Odor? Perhaps the Japanese have a refined sense of smell, as they are leading the world in research on odor. As an example, research designed to detect colorectal cancer from the chemical components of flatus is proceeding at Nagoya University. The research has uncovered the fact that the components of flatus from colorectal cancer patients contain more than 10 times the amount of methanethiol, a gas that smells like rotten onions, than from healthy people. These results are generating expectations that a method can be developed for screening colorectal cancer, a disease that has been increasing markedly in recent years and for which symptoms are not immediately obvious. In similar experiments at the same university, researchers are studying methods to screen for lung cancer by analyzing the components of breath odor. 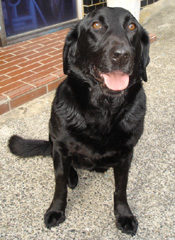 Meanwhile, at Kyushu University, dogs that have been trained to sniff for colorectal cancer, like dogs trained for detecting narcotics, are being used as cancer detection dogs in experiments designed to verify whether colorectal cancer patients can be identified through odor. The dogs have been able to accurately identify colorectal cancer patients in over 90% of the cases tested. Research was carried out on samples collected at two hospitals in Fukuoka and Saga prefectures, where the dogs successfully detected 37 of 38 cancer cases by sniffing the odor of patients' feces. These examples show how research on odor is being actively carried out in Japan for such purposes as detecting fire and other dangers and illness. The day when Japan's science of odors will benefit humanity must certainly be fast approaching.